Are you scanning the globe looking for that special place to memorialize your Happy Ever After? Then let me introduce you to some Venice Italy wedding venues and luxury villas in Venice Italy that promise a backdrop, unrivalled anywhere in the world, for your special day. Weddings, by definition, are meant to be romantic occasions. A great deal of creativity is brought to bear by some of the most talented wedding planners on the globe. The intention being to conjure up the most sublime and bespoke wedding experience for their happy clients. 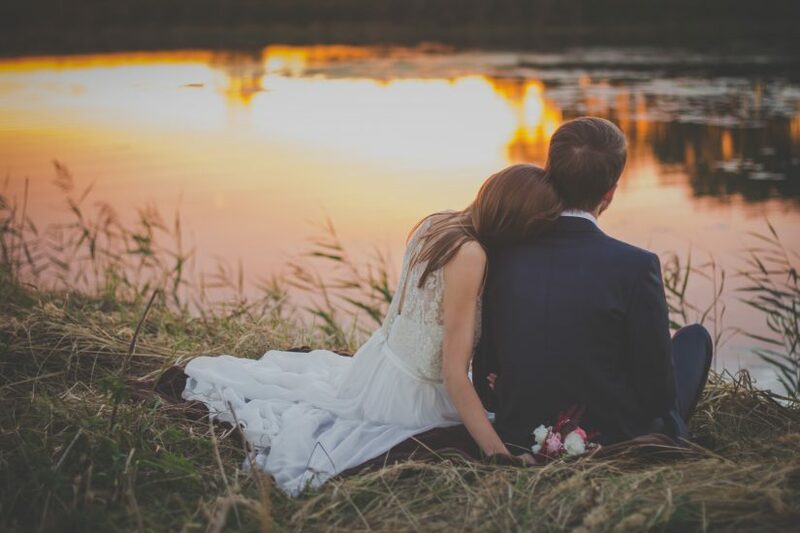 The dream weddings can really be anything from the garden wedding with a fairytale bower of cream-coloured roses or the hipster wedding in a converted barn complete with haybales and a friendly pony. The outdoor experience of nuptials at sunset on a beach compete with being married at dawn on a boat on a lake. As a guest, I’ve reveled in the magic and emotionally charged elements of each of these weddings. But, I must confess, in all my years of travel one of the most beautiful scenes I’ve ever witnessed is the sight of a newly-minted bride and groom being ferried through Venice’s waterways in a flower-festooned gondola accompanied by a group of musicians floating behind in equally pretty gondolas. The pastel hue of the buildings, the unique quality of light in a city that literally floats in a lagoon, brought together a tableau that simply charmed all of the tourists, like myself, lucky enough to see this enchanting event. Romantic perfection? Absolutely! Weddings in Venice take on a life of their own. The City’s majestic beauty allows the small, intimate family wedding or the large scale uber chic celebration to transcend to new heights. 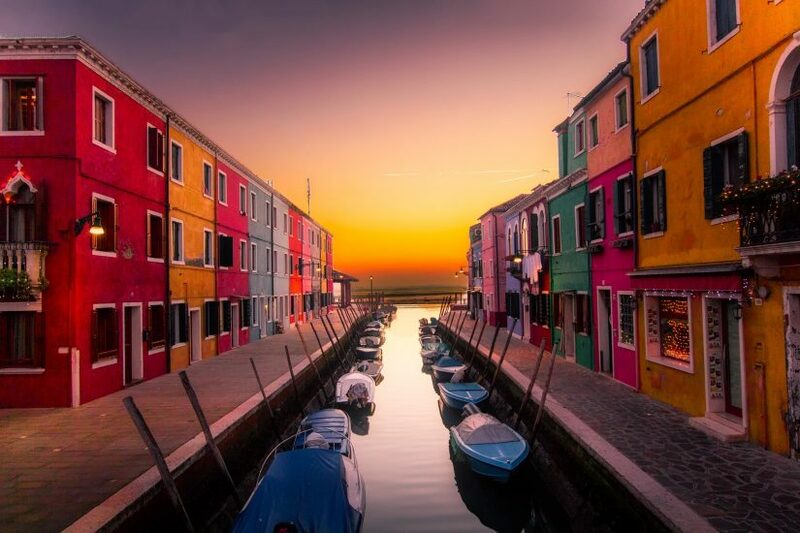 See our Venice guide for more information on this captivating destination. European weddings are becoming more popular each year. It’s not difficult to see why. You’ve centuries of history that provide divine churches and licensed venues where weddings can be formally conducted. If you are part of a country like, say, USA and have a lineage that you can trace back to Europe, it seems the perfect idea to begin your married future in a place that is full of the footsteps of your past. If Europe is the crowing glory for wedding venues, then it is the idea of getting married in Venice Italy that is the jewel in that crown. … and on the subject of crowns, what better way to celebrate your ‘happy ever after’ than in a bona fide palace in Venice. 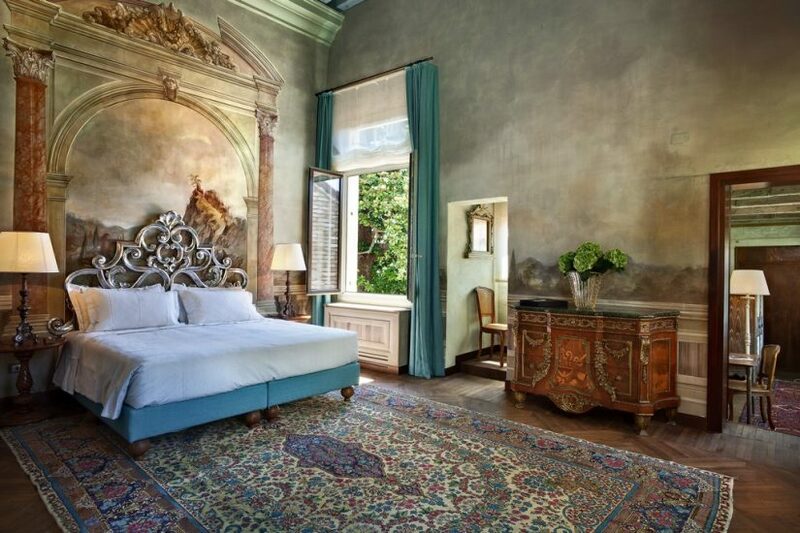 Villa F is a sumptuous palace with parts dating back to the 16th Century. 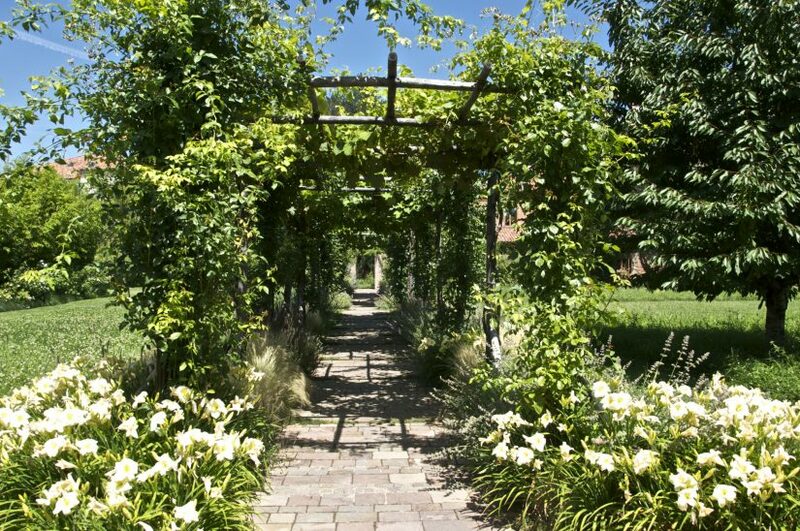 This beautiful property sits serenely in its large 3 acre gardens on the island of Giudecca. A short 5-minute boat ride will transfer you from this stunning property right into the heart of Venice: Centro Storico or historic centre. If you are looking at Venice Italy wedding venues, Villa F will fulfil the most demanding wish-list. A spacious and shaded terrace sweeps out from the fresh white façade of the Palace. Green lawns are arranged perfectly around the modernist inspired pool area. Trees and foliage provide a natural shade and a pretty flower encased bower leads to a secluded part of the garden overflowing with aromatic plants and shrubs. The pool has as inbuilt fountain mechanism that transforms the placid perfection of its surface into a divine water display. Whether your guests stroll around this garden under the warmth of an Italian blue sky or listen to the sounds of silence in a star-filled Italian garden, Villa F is unsurpassed as a venue for anyone getting married in Venice Italy. Much is said about the waterways that weave around the 118 islands that make up the City of Venice. 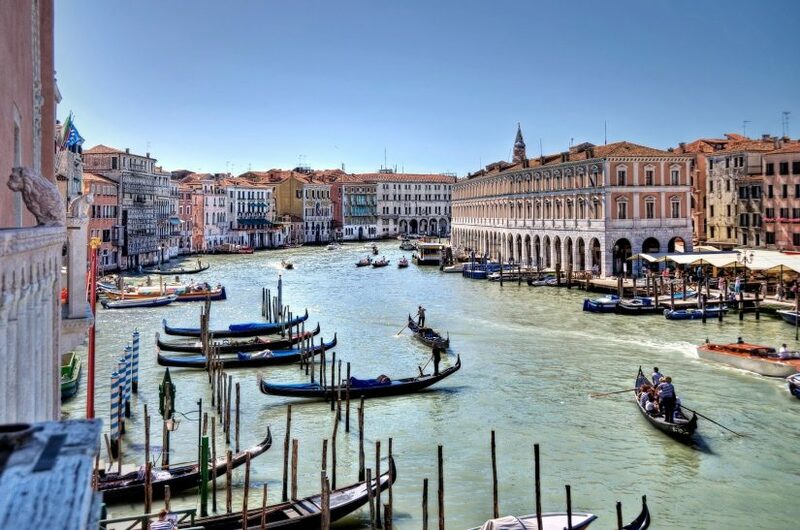 These incredible canals, bordered on each side by architecturally inspiring buildings and linked by pretty bridges that allow pedestrians to navigate the intricate lacework that makes up the pathways of Venice, make for the most unique destination anywhere in the world. 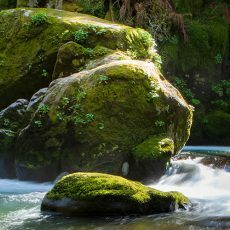 Of course, all of this water does have one disadvantage – there is a real shortage of gardens and green open spaces available to visitors. Consequently, Villa F with its three-acre garden, is one of the most unusual and desirable locations to stay within the city. The space the garden affords guests who may be staying at any of the beautiful apartments within this incredible Palace, is a welcome respite from the more confined spaces to be found within the centre of Venice. 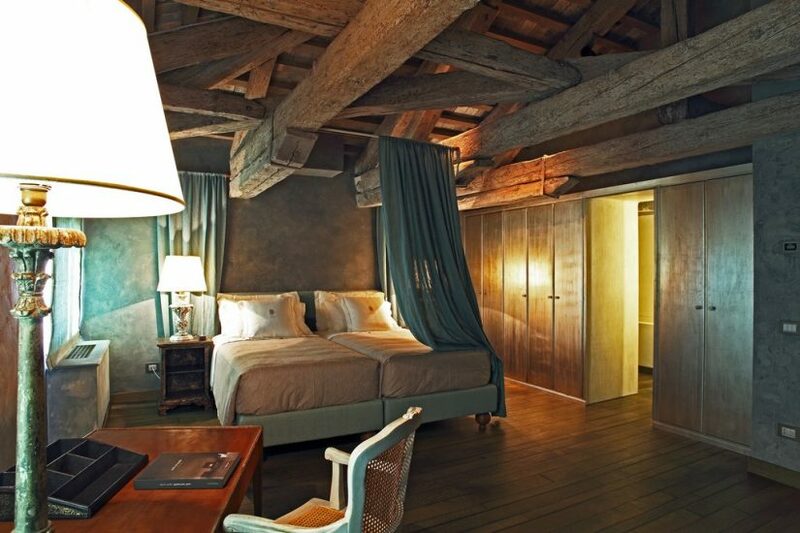 The luxurious 2-bedroomed apartment that is Residenza F, is the most-sought after accommodation within the Villa F. With the vaulted ceilings and sweeping views over the Giudecca canal and St Mark’s Basin, this dramatic and elegant apartment is the ideal place for any honeymoon couple. All of the beautiful features one would expect from a historic building are in place but with very glamorous and stylish decorative elements that bring a 21st Century standard of comfort to the lucky guests. The 3,500 sqft that make up this private villa, includes the full use of the extensive gardens and public areas of the Palace. Residenza F has its own private kitchen where Exceptional Villas can arrange for a chef to prepare the most delicious of Italian cuisine for you to enjoy by candlelight. There is a private terrace off the spacious reception room, that has unparalleled views. The bedrooms have king-sized beds that can be reconfigured as twin rooms. This flexibility would ideally suit a family or a small group of friends who want to explore the magic of Venice from a historic base. As well, this property has to be one of the most romantic places to stay in the City. You are near to all the attractions but still can enjoy that lovely level of privacy away from the hordes. In addition to all the facilities within Villa F, there is a private access gate to the Palladio Hotel next door that allows guests an opportunity to use the gym and spa facilities. At 2,500 square feet, this two-bedroomed apartment within Villa F benefits from sweeping views over St Mark’s Basin – the large waterway that fronts this stunning Palace. Again, like Residenza F, this property has its own kitchen facilities that allow guests to relax with all of the necessary amenities to enjoy a quiet night at home. The layout of Villa F means that Residenza F can be linked with Zaffiro and Perla to create a six bedroomed villa that can comfortably accommodate 12 guests. This combined property is known as Palace F. A smaller combination of both Residenza F and Zaffiro creates a spacious 4 bedroomed accommodation, called Noble Villa, that can be configured with twin beds in the rooms for greater flexibility. If you are a group looking to celebrate the perfect wedding, or perhaps you are looking to celebrate a significant birthday, this is the ultimate destination for you. You have all the facilities to host a memorable cocktail party or dinner – with access to your own private terrace where you can toast your occasion with a chilled glass of champagne! In fact, if you are looking for wedding venues in Venice Italy that could ideally host the pre-wedding dinner, then Villa F is truly ideal. It is intimate yet spacious. 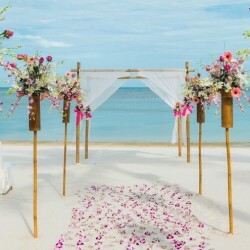 There is an opportunity to have the reception rooms filled with the fragrant flowers of your choice. Any speeches that are de rigeur on such occasions, will sit perfectly in this acoustically perfect space. With 11 self-contained luxury villa apartments within the Villa F, there are unique accommodation options for guests of all age and mobility. Agate is a pretty duplex with 2 bedrooms, en suite. This space is part of the 16th century area of the Villa – it has gorgeous garden views. Opale is a one bedroomed suite with a large fireplace. Again, the décor of the suite is a combination of heirloom pieces interspersed with the finest of modern luxury finishes. The word exquisite is used frequently to describe the muted shades and fabrics used to showcase the accommodations within Villa F. Turchese another one bedroomed suite, decorated in greens and turquoises, offers an opulent setting for 2 lucky guests. As with all of the fabulous apartments, there is air conditioning, TV, high speed WiFi, butler service, kitchenette facilities, ease of access for guests and all of the lovely touches that make Villa F the ultimate high-end vacation experience. The whole of Venice is at your disposal. 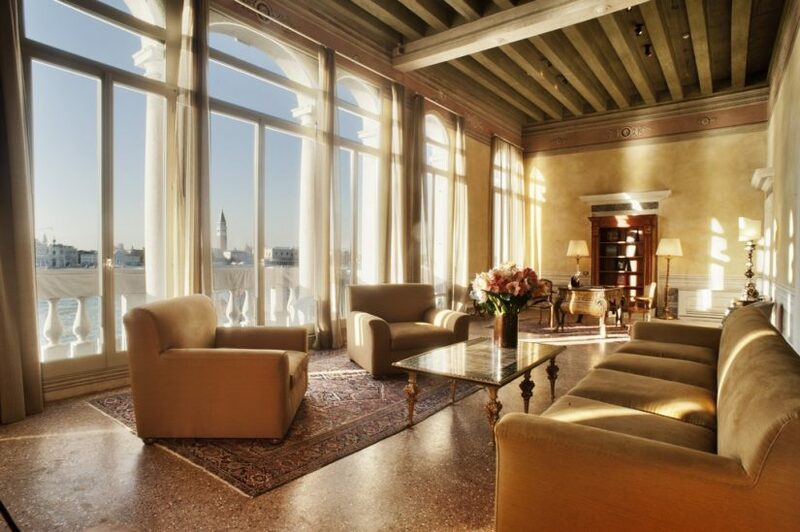 With a complimentary transfer by vaporetti from the Villa F to the heart of the city – a journey of 5 minutes – guests can have their breakfast each day at the Bauer Palazzo Hotel, located beside St Mark’s Square. This wonderful property, along with the lovely Palladio Hotel next door to Villa F, have an association that gives Villa guests access to the facilities of both hotel properties. Whether you are planning on getting married in Venice Italy civil, church or humanist service, you will want your event to be as original as you are. It’s soon becomes clear that Weddings in venice Italy are a no-brainer – just ask George and Amal Clooney! 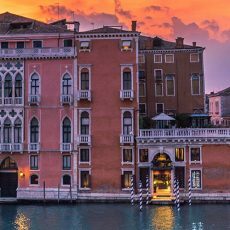 Don’t worry, if you haven’t them on speed dial, you only need to check out some of the spectacular images available on Insta to show that the perfect launching pad for ‘love everlasting’ is Venice. In addition to the opulence and privacy of Villa F, you and your close friends and family can experince a taste of Italy Venice and its’ world-class dining, centuries of history, designer shopping and so many other exciting activities. The city, known as the Pearl of the Adriatic, is the place to find a café, bathed in that magical golden light of the Lagoon, sip a Bellini and watch the world drift by. There’s something quite extraordinary about navigating a city by boat. It creates a tempo all of its own. The traditional gondolas will move you from one landing to another in a gentle way. If you are keen to truly understand the concept of ‘being in the moment’ then step onto a gondola. The pace you travel at through the maze of canals that make up the historic centre of Venice, will allow you to fully appreciate the architecture and design of this Italian city in a slow and measured way. Exceptional Villas has decades of experience introducing guests to some of the most beautiful places on the planet. We have chosen only the finest properties for our clients as we have not only an innate understanding of the needs of 21st century informed travelers but we always want to deliver a safe and relaxing experience for everyone. Villa F answers all the questions we ask of a property – sophisticated, luxurious, tasteful, well-situated, well-serviced …. the list goes on and on. What makes this property unique for us is its size and how it has been created, allowing the property to be re-configured to work for groups large and small. If you are looking for the ultimate wedding venue in Venice or perhaps you are a large extended family who want to celebrate a special occasion like a birthday or wedding anniversary, Villa F, provides space for different family units to mingle and have fun while still enjoying a level of seclusion and privacy that allows for a happy vacation experience for everyone. Each one of the 11 different apartments bring their own story with it. The gorgeous furniture, the bespoke artworks, the fine fabrics and subtle palettes of colours combine to create a property that would dazzle any lucky guests. Add to this the fact that Villa F is nestled in its private gardens in the heart of the most romantic city in the world, and you have a recipe for a memorable visit. If you are scouting the globe for the ultimate place to host that incredible event, then come stay at Villa F and get a glimpse into what your perfect event might look like. Under a canopy of stars, sipping prosecco in your Italian garden, with the lights of Venice twinkling across the expanse of St Mark’s Basin, you won’t need much imagination to see how you have found your corner of paradise and the very place where dreams are born. 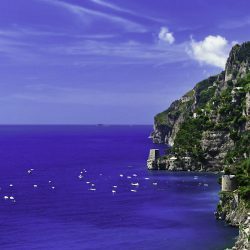 We also offer other wonderful destinations in Italy such as the Amalfi Coast and Tuscany.